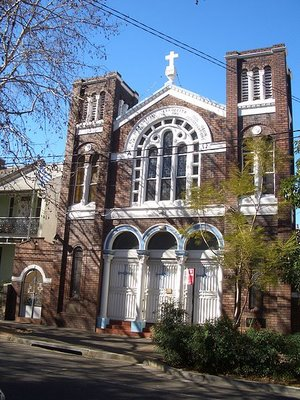 May 29 - On this day in 1898 the foundation stones for Australia's first Greek Orthodox Church, the Holy Trinity, were laid in Surry Hills, Sydney. The ceremony was presided over by Archimandrite Dorotheous, who conducted the service in Greek, and was attended by the Consuls-General of Greece and France, the Consuls of Russia, Argentina and Sweden and a large congregation of Orthodox Greeks and Lebanese. The three stones were laid (two in opposite corners, and one in the centre where the altar would be placed) and within each stone was placed a small iron cross, a bottle of holy water and a collection of English and Greek silver coins.